Middle Daughter is at college and not able to come home for a few weeks, due to commitments there, so Snow White and Rose Red helped me put together a care package for Auntie. 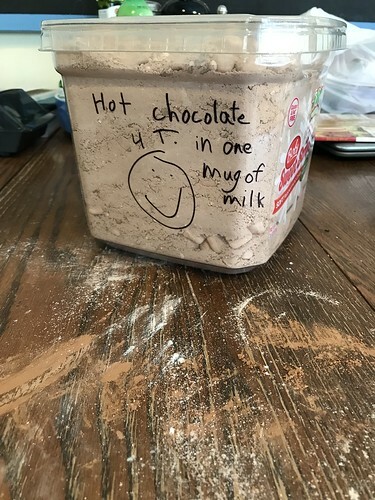 We made hot chocolate mix and mug cake mix. 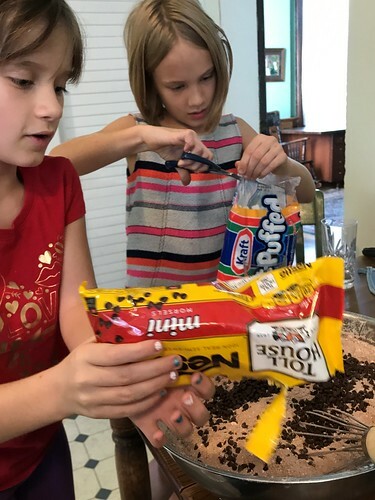 Snow White added the chocolate chips to the hot chocolate mix. Rose Red added the marshmallows to the hot chocolate. 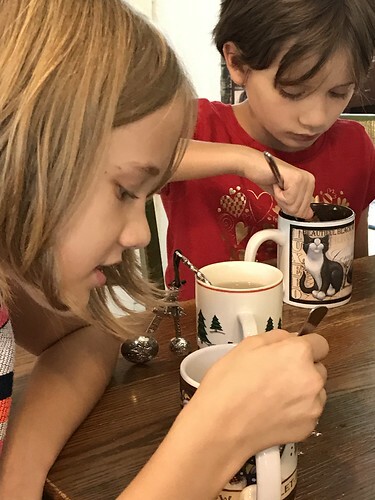 Over time, the marshmallows become dehydrated, but they come back to life when heated in a mug. Serving ~ 3 T. of mix to one mug of hot water or milk. If you like it sweeter, just add more sugar or sweetener. 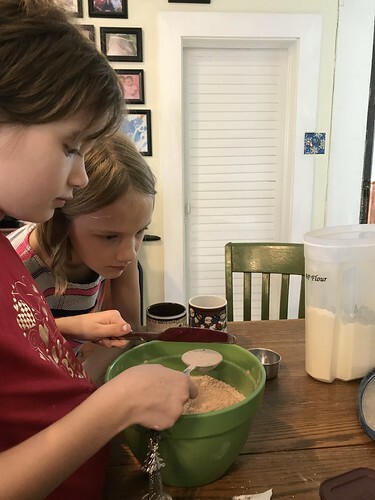 The mug cake mix was pretty easy to make, too. The grands mixed this themselves. 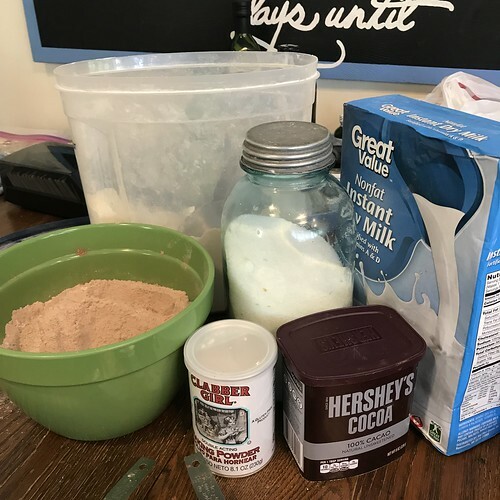 We used the recipe at this link: Chocolate Mug Cake Mix / We doubled this recipe. 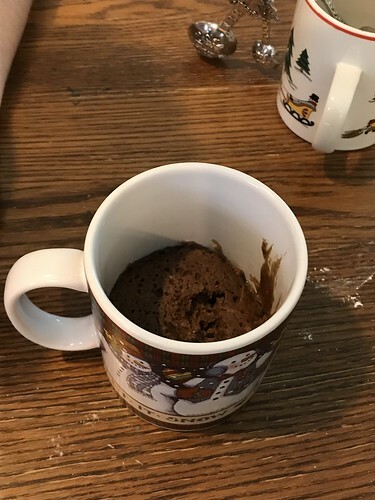 To make a mug cake, measure 4 Tablespoons of mix into a mug. Add 2 Tablespoons of water or milk. Cook in the microwave on full power for 40 seconds. This amount made about half a mug of cake. Vary the amount to find the right portion for your mug. The proportion is two tablespoons of mix to one tablespoon of water. A larger amount than the recipe states may take five or ten seconds longer to cook. The mug cakes would be delicous with whipped cream or a scoop of ice cream on top. 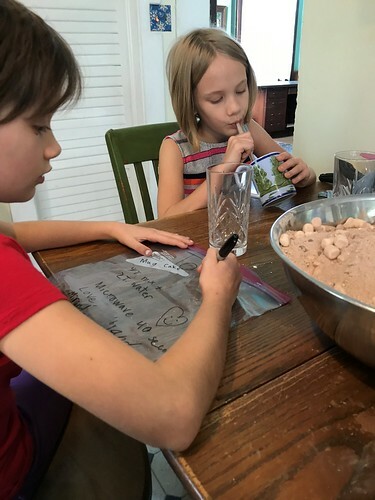 The grands had a good time measuring and mixing. 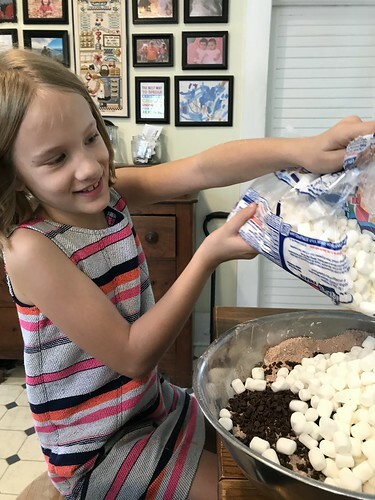 This entry was written by ~~Rhonda, posted on September 23, 2017 at 6:33 pm, filed under Recipes. Bookmark the permalink. Follow any comments here with the RSS feed for this post. Post a comment or leave a trackback: Trackback URL.